NETWORK UPDATE: There were 0.1 increases aplenty for CBS and ABC, with bumps for SURVIVOR, CRIMINAL MINDS, THE MIDDLE, THE GOLDBERGS and MODERN FAMILY–although in ABC’s case, that didn’t make up for their losses from their last airings. It’s a mark of how quiet a night it was on Wednesday cable that THE DAILY SHOW made it into the night’s Top 4, despite a relatively routine 0.54 rating (up 0.08 from Tuesday, when it ranked #22). Earlier in the evening, WORKAHOLICS did have a strong night, up 0.17 to 0.63, but that didn’t extend particularly well to the premiere of BIG TIME IN HOLLYWOOD, FL that followed, which lost more than 45% of its lead-in to 0.34. At the top of the night’s cable originals was CATFISH (MTV), down a tenth from last week to 0.68. ESPN’s NBA doubleheader was at 0.61/0.44, down 0.13 from last week’s game even though last week there was competition from the NCAA play-in games. On Lifetime, LITTLE WOMEN LA (Lifetime) did best with a reunion special at 0.47, followed by a LITTLE WOMEN NY episode at 0.41. TLC’s MY 600-LB LIFE lost 0.04 to 0.44, and both episodes of STRANGE LOVE were at 0.33. 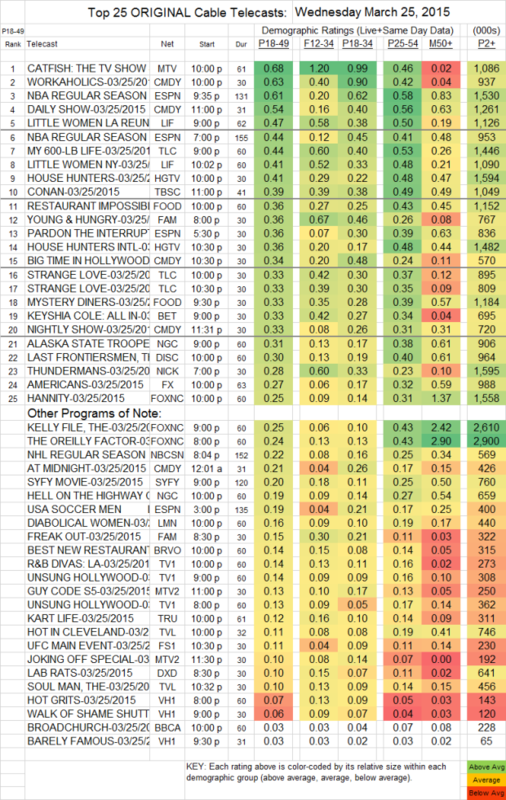 The season premiere of ABCFamily’s YOUNG & HUNGRY was at 0.36, which was around the same level as MELISSA & JOEY and BABY DADDY had been doing in that slot, but FREAK OUT launched tepidly in the next half-hour at 0.15. On BET, KEYSHIA COLE was at 0.33. THE AMERICANS (FX) slid 0.04 to 0.27. BEST NEW RESTAURANT (Bravo) stayed at 0.14. On TVLand, HOT IN CLEVELAND took a big hit, down 0.12 to 0.11, and SOUL MAN was chopped in half to 0.10. VH1’s new pair were even more dismal, as WALK OF SHAME SHUTTLE fell 0.11 to 0.06, and BARELY FAMOUS justified its title by dropping 0.04 to 0.03. BROADCHURCH (BBCAmerica) had a bad night as well, down 0.02 to 0.03.